After dealing with the growth on Ellie’s face for 5-6 weeks, we decided to risk surgery and have it removed. It just became too difficult for us to manage as the growth would bleed profusely at the slightest bump and easily became infected. Poor Ellie was just miserable, between wearing the e-collar all the time and us trying to keep the growth cleaned, it felt like we were torturing her. We took her into the clinic early the day of her surgery in order to complete some testing first. We had decided that if her blood work looked good, we were going to go for the surgery. We understood the risks associated with anesthesia were higher in her case as she has a heart murmur and some arrythmia had been noted. 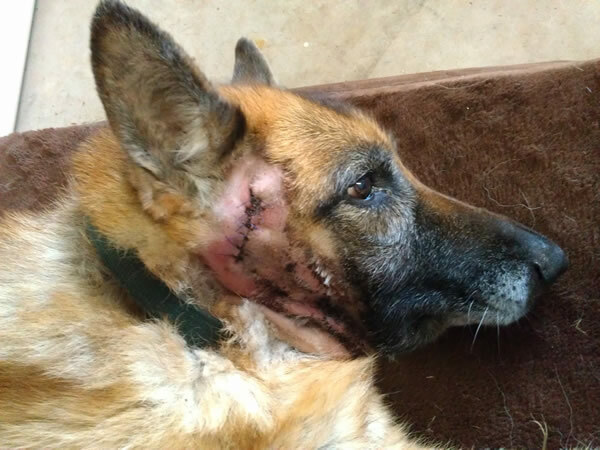 We felt that if she did not survive the surgery, at least she would not be awake and wouldn’t suffer any pain. She was starting to get so upset each time we had to work on cleaning her up and her heart rate increased to the point that I was afraid she might suffer a heart attack and then she would suffer a painful death. Her blood work came back in all normal ranges so the surgery was a go. Dr. Bramson performed the surgery and Dr. Keane also came in to help monitor the anesthesia. Nancy and I were both in surgery to assist the doctors, so Ellie had a lot of people working to make sure she came through in good shape. She was just lightly under anesthesia and for as short as time as possible. She was pretty out of things for the rest of the day and through the night, which was to be expected. By the second day she felt like eating a bit and was on the road to recovery. She developed a lot of edema below the surgical site and her poor face was so swollen for several days but now she is looking really good and it is such a relief for her as well as us to be rid of that growth. 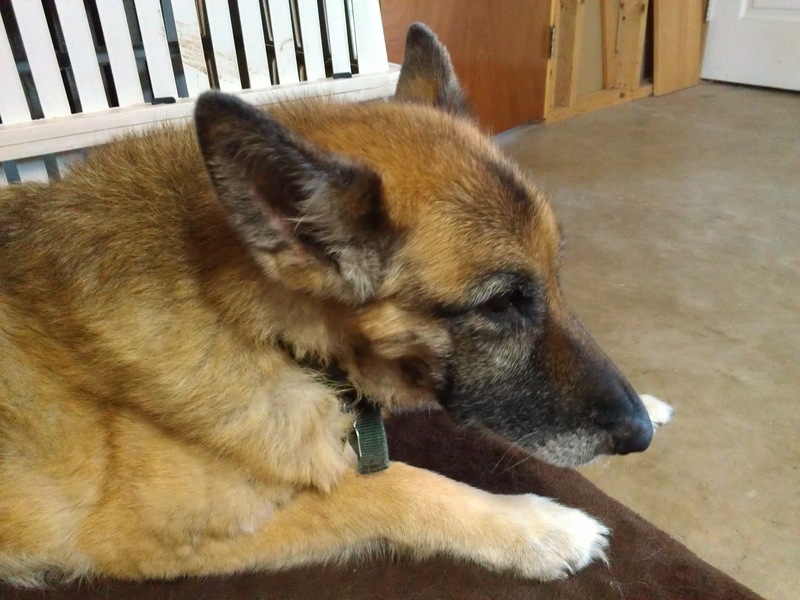 Oh, and May 18 was Ellie’s birthday – 14 years old! I’m so glad she could celebrate the day without the e- collar! Happy Birthday, sweet girl! Bob was born in the spring of 2000. 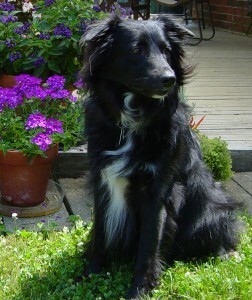 I had been thinking it might be nice to bring a new pup home for companionship for Ellie while I worked during the day, but I wasn’t really in the market for a puppy when I saw a sign at the pet store for “Free Border Collie mix puppies”. I was just going to stop by and look at them – I should have known better. They were all very cute, of course, but one pup attached himself to my leg and did not stop looking at me the entire time I was checking out the other puppies, so how could I refuse him! I thought he looked like a “Bobby”. I will never know why he fell in love with me like that, but it became quite evident when we got home that I was the ONLY one that he loved. I don’t ever remember seeing a puppy act quite like that before. He was not playful or friendly with anyone else and ran away and even growled and snapped at other family members, even though he was the sweetest little thing for me and just stared into my eyes adoringly. This behavior continued for a few months. The situation became so bad and everyone else was so unhappy with the new pup, (who had become just Bob, definitely not a Bobby), that I actually drove him to the animal shelter with thoughts of giving him up. I had to give them a brief history of the pup and they explained that they had so many dogs up for adoption and too little help to work with an “unfriendly dog” and he would be euthanized. I sat in the lobby crying my eyes out with Bob staring at me with those adoring eyes for nearly an hour. I knew my family was not going to be happy, but I had no choice. I could not leave him there to be killed when I was the only person in the world that he trusted and loved. That was, gosh, 11 years ago. Bob has mellowed over the years and will tolerate the presence of others, but it is still evident that he prefers only me and Todd. Bob still looks at me like he is completely in love and now he looks at Todd the same way, but no one else – that’s it! Ellie was born 5/18/1998. I had wanted a German Shepherd Dog for years. I always thought they had a look of intelligence about them and that they were very trainable dogs. I’m sure the fact that I thought they were beautiful animals was in there also. I spent 2 years researching and checking out different breeders before deciding on the von der Hollenburg kennel in Greenville, Ohio. I met all the dogs that were scheduled for upcoming matings, and after selecting a prospective pairing, paid a deposit on a female puppy that was yet to be conceived. Everything went according to plan and I got a call when the puppies arrived. I went to visit them when they were a few days old, but of course it was way too early to make a selection. I returned when they were 4 weeks old and chose a little bundle of fur and energy, who really looked just like all the others. Whatever it was that made me choose her, it was a choice that I have never regretted. Ellie is and always has been a wonderful dog. It just goes to show you what great dogs caring and responsible breeders produce. She does come from royal lines – her full name is Stewart’s Ellie von der Hollenburg. Parents – Mike vom Haus Bork and Iff Iv-Re. Great grandparents – 2 time World Seiger (champion) Uran vom Wildsteiger and herding champion Pischa vom Kirschental. All that is great, but what I really care about is what a sweet and gentle dog Ellie is. As she was born the same year as my granddaughter, Darrien, I wanted a “kid proof” dog. When she was a pup, I spent a lot of time tugging on her tail and ears and feet, sliding her around on the tile floor, getting my fingers in her ears and mouth – all the things a toddler will do to a dog. As a result, Ellie would happily take anything that Darrien could dish out, and find it all to be great fun. I remember when Darrien first started climbing up onto the sofa she would often use Ellie as a step stool, as quite often the pup could be found taking a snooze with her back up against the sofa. Ellie not only didn’t mind this practice, she usually didn’t even wake up! throw it just once more, pleeease! My Ellie is getting up there in years now. 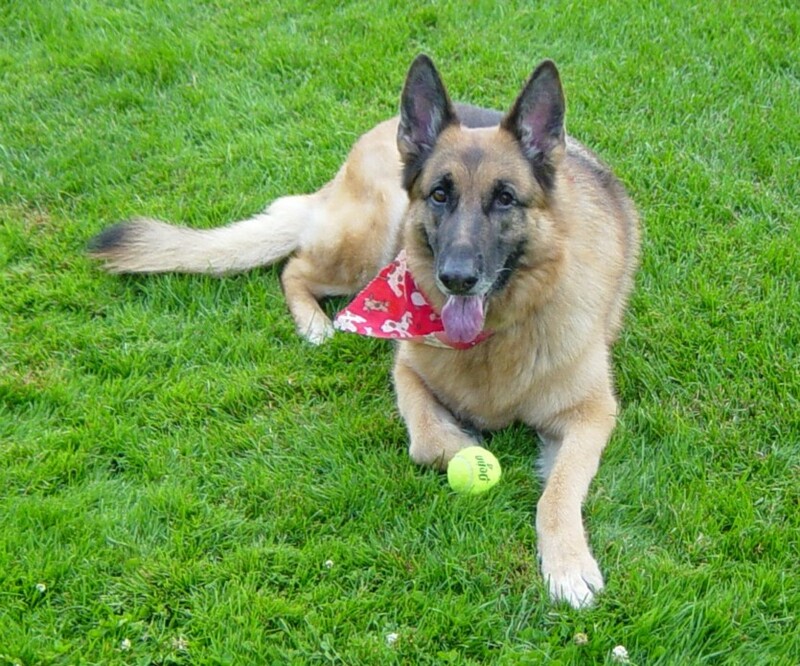 All her life her favorite pastimes have included chase the tennis ball, chase the tennis ball, chase the tennis ball and chase the tennis ball. 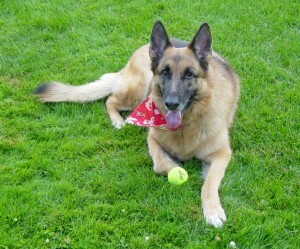 Now it is more like chase the tennis ball, sleep, rest, walk, carry the tennis ball around a bit and then take a nap. 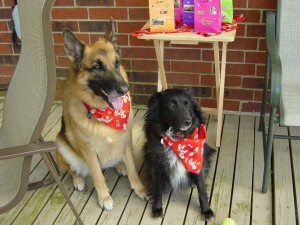 Meet our dogs, Bob, a Border Collie mix & Ellie, a German Shepherd. This photo was taken a few years ago at Ellie’s birthday party. She had 6 doggie friends attend the party where everyone enjoyed some social time and treats in the back yard. Bob spent most of the party in the house after he growled at one of the party goers (he is a little lacking in social skills and prefers to spend his time with only us). Ellie, on the other hand loves everyone and enjoys new experiences.